1) NEW EVENT MAP MAZE OF DIMENSIONS HAS BEEN ADDED. 2) THE MAZE HAS BEEN CREATED BY ELENA, THE DESCENDANT OF ETRAMU. DAMAGED BY KUNDUN THE PLACE IS NOW MADE OF INCOMPLETE DIMENSIONS. (1) Maze of Dimensions is an event map, only available for a limited time. (1) You can enter the maze through 'Dimensional Gate' at Event Map Square (236, 58). (2) Only individual characters can enter, and no party entry is permitted. (1) Maze of Dimensions have areas all separated, and you can only move between areas through gates. ① At some areas you cannot see a visible gate. 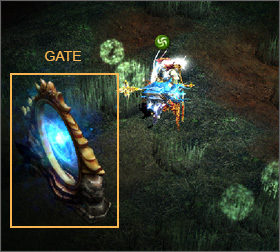 In these areas, you need to complete a required mission in order to create a gate. (2) Maze of Dimensions consists of 7 stages. (3) Start by 1st floor, and you can move to the next stage after clearing the current stage. (4) Find the way out, complete all the required missions in order to clear stages. (5) There are rewards for clearing every stage. (1) Mini-map (Tab key) is available in the Maze of Dimensions. ① Only the entrance, exit and the areas you have been will be shown in the mini-map. (3) You can exit the Maze of Dimensions by character re-login, or movement command. The progress will be saved, and you can continue playing if you enter the maze again. ① Upon entering the maze again, the character will start at the maze entrance. ② In case of character transfer or server transfer, the maze status will be reset. 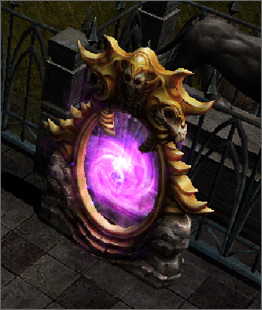 (4) At the Maze of Dimensions, you cannot use Town Portal Scroll. (1) There are rewards for clearing every stage. (2) Amount of rewards are different depending on the stage number. ① The higher the stage is, the more rewards you will get.